We are pleased to begin 2019 with the official launch of SAiDTalks! Published on the second Thursday of every month by SAiD’s Lara Abiona, SAiDTalks is a monthly interview series where we chat with today’s most prolific African diaspora leaders who are starting new conversations and paving new paths. From names that have been everywhere in recent years to unsung heroes making impact locally, nationally, and internationally, the African diaspora has a multitude of bright, ambitious minds venturing where others have not and making significant contributions to society. Beyond admiration and celebration, SAiDTalks aims to humanize the high achievers and visionaries in our communities and take the lessons we learn from them to start wider dialogues. From African immigrants and Afro-Caribbeans in North America, Europe, and Asia, to African-Americans, to Afro-Latino communities across South America, the African diaspora is more diverse and multi-faceted than it has ever been. With this diversity in background comes diversity in viewpoints, and through SAiDTalks, we look forward to exploring these perspectives, one change maker at a time. Our inaugural interview is with the Person of the Year from our 8th Annual African Diaspora Awards, Ms. Nnedi Okorafor. She is an award-winning Nigerian American author of African-based science fiction, fantasy and magical realism for children and adults. Her works include Who Fears Death (currently being developed by HBO into a TV series), the Binti novella trilogy, the Book of Phoenix, the Akata books and Lagoon. She is the winner of Hugo, Nebula, World Fantasy, Locus and Lodestar Awards and her debut novel Zahrah the Windseeker won the prestigious Wole Soyinka Prize for Literature. 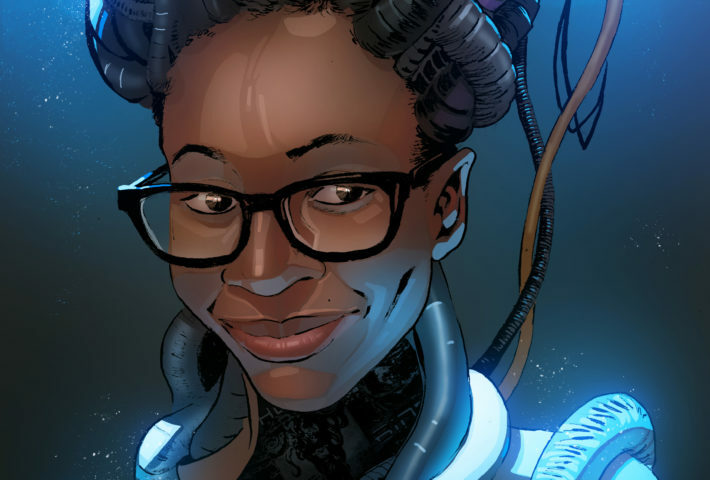 Nnedi has also written comics for Marvel, including Black Panther: Long Live the King, Wakanda Forever, and now the unlimited series Shuri. 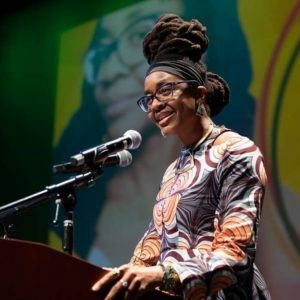 Nnedi spoke with us about coming to New York City for the awards right before the release of her recent graphic novel, La Guardia, her advice to new writers, and what it means to “choose your tribe” as a Nigerian-American. You have had an amazing 2018, from your work with Marvel Comics and the Black Panther spinoffs that you have written, to the HBO adaptation of your bestselling book, Who Fears Death, that is currently in the works with George R. R. Martin of Game of Thrones as Executive Producer, as well as your appearance at the Emmys! What were some of your personal highlights from this year alone? Honestly, the year was so busy and amazing and fast-paced, that there has been little time to stop and squeal with glee. Not for very long, at least. And there have been several things happening that I can’t make public that are utterly incredible. But if I had to choose something (that I can publicly discuss), I’d say the pre-party at the Emmy Awards when I had a wonderful conversation with Jonah Nolan about screenwriting was one of those highlights. He’s someone whose work I deeply respect, from Interstellar to Batman Begins to Westworld. That was a fine moment. It was an organic conversation, not something I sought to have, and some of the lessons he passed on to me about screenwriter were utter gems. I also must say that seeing the inked and colored pages for my comic series LaGuardia done by Tana Ford and James Devlin were moments of pure delight. Of all the comics I’ve done, this one was my story, these were my characters, this was a world I’d been seeing in my mind for years. Seeing the images outside of my head rendered by such amazing artists was breathtaking. You have just released your latest project, La Guardia, which returns to the universe of the Binti trilogy and your novella, Lagoon. It centers on African and alien immigrants in Brooklyn, so it is perfect that you came to New York City for the African Diaspora Awards just days before the release! Tell us more about the project and how it builds on Binti and Lagoon. Yeah, it was great coming to New York for the African Diaspora Awards and the timing was perfect. And it was icing on the cake that we (my daughter Anyaugo and I) happened to come through LaGuardia Airport, the source of inspiration for my LaGuardia comic series. Upon stepping outside, we came across one of the airport security robots and we both just burst out laughing. It’s not that LaGuardia builds on the worlds of Binti and Lagoon, it’s that it’s set in the same universe. The story is in the timeline. So it was more like I was telling a story that happened at a specific time. LaGuardia happens a few years after the events of Lagoon. Lagoon is the story of First Contact, when alien arrive on Earth and that arrival happening in Lagos, Nigeria and the pandemonium and paradigm shifts that result from that arrival. LaGuardia is a story that happens after things have been established and settled down. After human beings have learned to share the Earth with other sentient intelligent life forms… and the stories that arise from that. It’s not Men in Black or alien Nation or a riff off of anything else that’s been previously done. It’s not a metaphor, either. It’s what happens after Lagoon, after People arrive. The story is very close, it’s very much about characters not premise. And even though some of the story is set in the US, the focus and point-of-view isn’t American, it’s African. I’ve shifted the default in this tale. You have been on the literary scene for a while, and have written countless award-winning and internationally renowned books and comics for children, young adults, and adults alike. What advice do you have for writers, young and old, striving to produce and create at this level and work past any writer’s block or dry spells they may be experiencing? How about let’s replace “young” and “old” with “new”. People become new writers at all ages of life and no age is more special than any other. Anyway, so my first piece of advice is don’t try and do what I do; follow your own path. I mean, what, are you going to also go through all the things I went through to get to where I am? That’s not even possible. Writing is a very personal thing and writers should thus understand that they have to find and follow what works specifically for them. Also, we all have different skill sets, one should move in the direction of one’s own gifts. Writer’s Block: I don’t believe in writer’s block. Never have. I think a lot of that has to do with the fact that I started writing without expectations. So I didn’t feel any pressure. Pressure is where a lot of the fear of Writer’s Block originates, I suspect. Feeling you must write every day is one type of pressure. Focusing on getting famous or making money by writing is another form of pressure. I think that it’s ok to not know what happens next. It’s part of the process to have to wait. To let something mature. I also suspect that believing in writer’s block is a self-fulfilling prophecy. Move on, go write. Go see what happens instead of talking about what might or might not happen. The theme for the 2018 African Diaspora Awards was “African Renaissance: Choose Your Tribe”, where we called on Africans in the diaspora to take charge of their role in creating the Africa that we want by “choosing their tribe”, or finding their community of like-minded change-makers and getting straight to work. SAiD believes that this African Renaissance will be led by innovators, disruptors, activists, and trailblazers. If you were to choose a tribe, would you be an innovator, disruptor, activist, or a trailblazer? I’d be a part of all four of those tribes, but I’d always have a foot on the outside. My tribe is many and none. I’m Nigerian American, thus this is a state of being I’m quite used to and comfortable with. So as we have said, your name has been everywhere this year, and we do not see that changing anytime soon! Please tell us some of the projects that we can look forward to seeing in 2019, especially when we can expect to Who Fears Death to premiere! I have my first nonfiction book coming out in June. It’s called Broken Places & Outer Spaces and it’s being published by TED Books. This slim nonfiction book is part memoir of the disturbing life-changing incident that led me to become a writer instead of an entomologist, part journey into what it means to be an interested and engaged Naijamerican, part essay about Frida Kahlo, Hugh Herr and Mary Shelley, and part science fiction with a dash of discussion about what Africanfuturism is to me. In my diverse repertoire of works, this one felt really necessary and I’m glad I was able to write it despite being so busy with other things. It explains and contextualizes a LOT. The rest of the LaGuardia series will also be released next year. The complete Binti Omnibus will also be released in February and that will include a new Binti story. There is one big announcement coming that I wish I could make here, but alas, it’s too soon. This coming year is going to be amazing, inshallah. As far as Who Fears Death, when I have more to report, I certainly will. For now, all I can say is that we are at work.